My interest in family history was piqued in 2012. That year began a journey of surprises. Whispered family rumor was finally substantiated by autosomal DNA. A laboratory confirmed that my paternal grandfather was the product of a relationship between my great-grandmother and a man named Samuel Kirk. This was shocking news, of course, because Samuel was not her husband - and he was not the man I had believed, without question, was my great-grandfather. I quickly learned my first lesson of genetic genealogy: DNA doesn't lie. In an instant, I discovered my biological patrilineal surname was Kirk. With a hard-earned appreciation for genetic genealogy, I was careful not to make any assumptions about my new paternal ancestry. In other words, I didn't hop a jet to Scotland, buy myself a kilt, or enroll in bagpipe lessons. Although Kirk clearly seemed Scottish, I was cautiously discerning in my ancestral origins research. Instead, I carefully traced my newfound paternal line back several generations, studiously pairing the paper trail with DNA tests. I left nothing to chance or assumption - the results of the lab and archives reinforced each other. Every preceding generation was confirmed in blood (okay, not really blood, but saliva or cheek swab sample doesn't hit the same dramatic note). Suffice it to say, there was an abundance of autosomal and Y-DNA testing involved. Ultimately, the pedigree ground to a halt at a man named Thomas Kirk - my fifth great-grandfather. Thomas was born in 1778 in Virginia (most likely) and died in 1846 in Licking County, Ohio, where he lived much of his life. Who were Thomas' parents and what were their ancestral origins? Damaged and heartbreaking records loss have foiled efforts to move beyond Thomas. 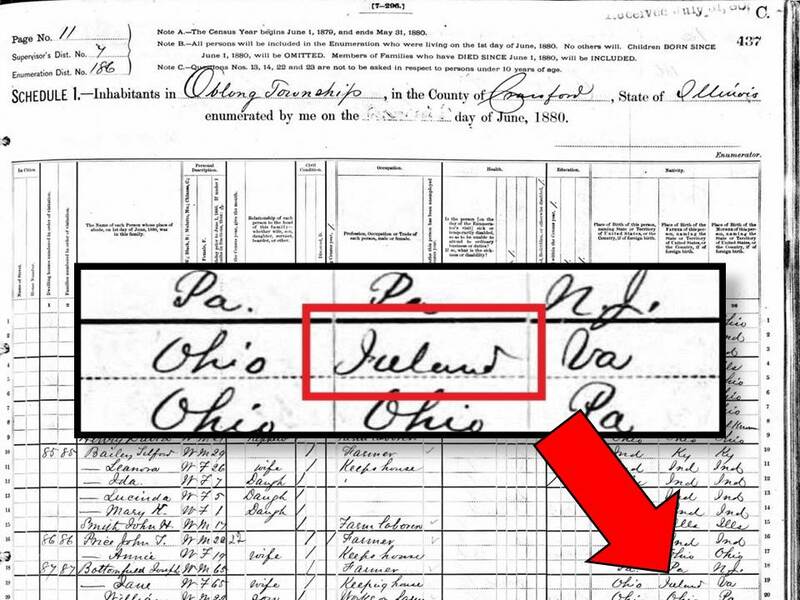 Ohio census records before 1820 are non-existent. An 1875 fire in the Licking County courthouse destroyed many probate records, including the bulk of Thomas' file. There is no known family bible. County tax and property records are interesting, but do not include any obvious smoking gun. The paper trail is frustratingly sparse when it comes to the question of Thomas' parentage and ancestral origins. Except two curious bits of information. 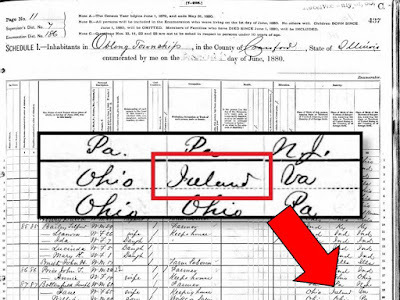 In the 1870, 1880, and 1900 US Federal census enumerations, Thomas' children gave their father's birth location as US-based and, beginning in 1880, the majority specified Virginia. However, in 1880, his daughter Jane (Kirk) Tracy Bottenfield went rogue and indicated her father was born in Ireland (contradicting her US-born response in 1870). What should I make of her response? Was Thomas of Irish descent? Perhaps Jane's Ireland response hints at her father's ancestral origins and not necessarily his actual birth location. As author and family historian Barry McCain noted, "Scots-Irish in Colonial America ... often described their ethnicity as simply Irish." "I was told the following: The family originated in Ireland. 4 or 5 brothers left in the potato famine for Scotland. They changed their name to Kirk (very common name) and emigrated to America. I have no dates for any of this. 3 or 4 landed in Ohio near what is now Cincinnati." A lot of history was packed into those few short sentences. We know Thomas was in the US well before Ireland's Great Famine (1845-1852). Records show he paid taxes in Fairfield County (the predecessor to Licking County) as early as 1806, and purchased land in Licking County in January 1812. Perhaps, if there is any truth to the lore, the "4 or 5 brothers" leaving Ireland in a potato famine for Scotland were Thomas' father and uncles (or even grandfather and great-uncles) and the famine was an earlier event - maybe the Irish Famine (1740-1741). Most curious to me was that the family purportedly changed their surname from something Irish to Kirk. DNA had already abruptly acquainted me with that experience. Suffice it to say I wasn't rushing to the DMV to change my surname on my driver's license. I began to wonder what role there was for DNA in helping me leapfrog beyond Thomas Kirk and his Ohio brick wall. 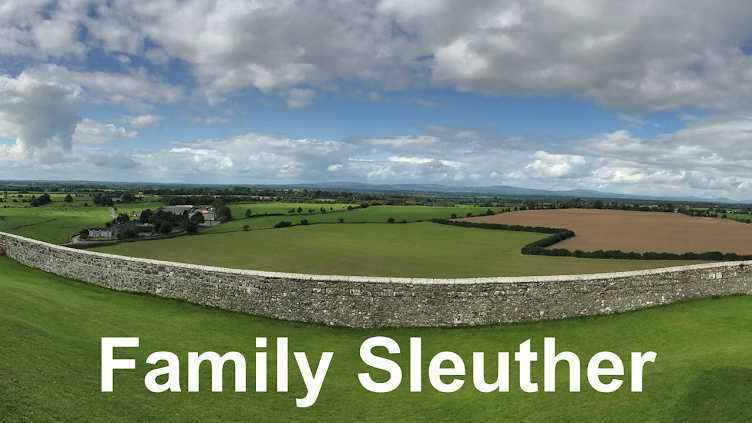 Could genetic genealogy help me find my ancestral homeland in the Emerald Isle? Thomas Kirk had seven sons who lived to adulthood and had children of their own. Fortuitously, there are living direct male descendants of each of these seven sons. After a great deal of sleuthing, I tracked down seven of these men living in seven states. Each were distant cousins who were third and fourth great-grandsons of Thomas Kirk. Committed to uncovering our shared ancestral origins, they all agreed to complete a Y-DNA test. The Y-DNA (111 Short Tandem Repeat) results of the seven men allowed us to control for genetic mutations - a naturally occurring phenomenon - and identify Thomas' likely original Y-DNA markers. Having essentially pinpointed Thomas' original genetic signature, we could now confidently search for other men who matched him in the hopes of identifying new family members - perhaps even in Ireland. Thomas' recreated Y-DNA results did indeed identify two close genetic matches. The first high-level match was to a man who shared the Kirk surname. But this man was not a direct descendant of Thomas Kirk (1778-1846). Instead, he was, I believe, the descendant of a man named Vachel Kirk (1783-1836) who lived in Fairfield, a city in Ohio that stretches across both Butler and Hamilton counties. Fairfield is about 20 miles north of Cincinnati. Yes, Y-DNA testing found a Kirk cousin who descended from a Kirk, a contemporary of my Thomas, who lived near Cincinnati - the city identified in the family lore. Suddenly the family lore was earning its spot in the library's non-fiction catalog. The alleged Ireland origin increasingly seemed more plausible. A second high-level Y-DNA match was to an American man with the surname Quirk. His ancestry traced back to a Thomas Quirk (1802-1882) who was born in Ireland's County Tipperary near Cashel. Thomas was the son of Michael and Catherine (Keating) Quirke, also of County Tipperary, Ireland. If Quirk's genealogy paper trail was correct, this close genetic match may have helped my Kirk family pole vault over the Ohio brick wall and land in southern Ireland. Both this Quirk match and two of Thomas Kirk's descendants completed Family Tree DNA's Big Y-500 test, which "tests thousands of known branch markers as well as millions of places where there may be new branch markers." The higher level Y-DNA test identified unique (Single Nucleotide Polymorphisms) markers shared by the Quirk and Kirk men. A Family Tree DNA group administrator who helped guide me through this process offered congratulations: "This is just what you were looking for. The results cement the relationship between your Kirks and the Quirks." Another researcher noted that our shared haplogroup (what the International Society of Genetic Genealogy defines as a genetic population group of people who share a common ancestor on the patriline), "is Southern Irish in origin." She added that it "is considered to be strongly the origin of the Eóganacht dynasty with great numbers of our members [other tested members of the group] in this sub-branch having Eóganacht surnames." I had to quickly brush up on my southern Irish history. According to Wikipedia, the Eóganacht was an Irish dynasty based near Cashel that ruled southern Ireland (now the province of Munster) from the 6th to the 10th centuries. There was a hiccup in linking this geography and my family. Kirk is not a southern Irish surname. It is a Scots Anglo Norman surname. Is this where the name change comes into play as suggested in the family lore and Y-DNA results? A third researcher weighed in: "O'Quirk, by the way, is a Munster (Eóganacht Cashel) name and a Munster origin of your family is highly likely." I subsequently learned that O'Quirk is believed to be a derivative of the original Gaelic surname O'Cuirc. Did the O'Quirks leave Ireland for Scotland, as the lore suggests, where their name was Anglicized to the phonetically similar Kirk? That doesn't seem too far fetched. 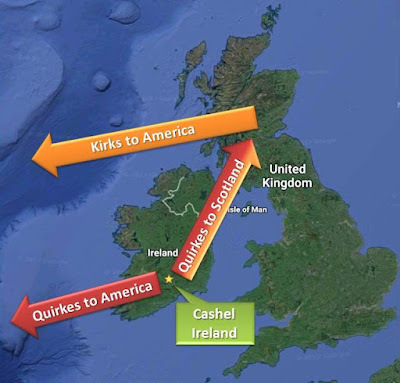 The Quirk family that is a genetic match to my Kirks may have protected the integrity of their surname by bypassing migration through Britain and heading straight for America. Whatever the circumstances, the Quirk (or Quirke) surname is still prevalent in southern Ireland, particularly around the Cashel area. Are these Quirkes distant genetic cousins and the roots of my Irish patrilineal heritage? The journey is not over yet. 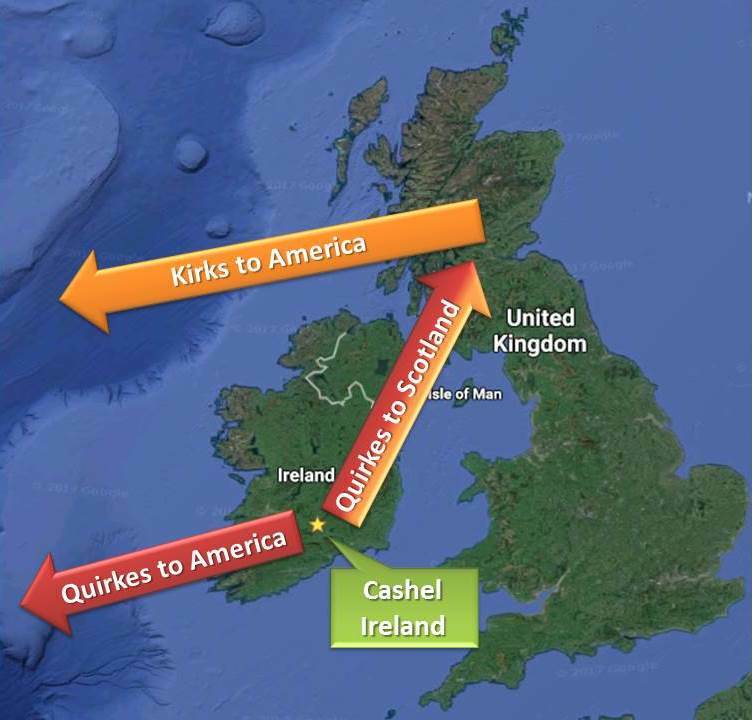 I want to link my US-based genetic family (both Kirks and Quirks) with Quirkes in Ireland. Accordingly, the next step is to identify male Quirkes in the Cashel area willing to participate in Y-DNA testing to help substantiate these research claims. While all signs point to my Kirks having southern Irish origins and a DNA link with the Quirk surname, I need genetic proof to anchor the theories in the Emerald Isle. A Quirke male from Cashel, Ireland could play a pivotal role in confirming my ancestral origins, and bringing the evolution of my surname to its final conclusion - back to where it all began. It is pretty remarkable the role science and DNA can play in helping us piece together our ancestral origins. Was your 2nd great-grandmother from Ireland or did she live in the US? I suppose the bright side of that challenge is that you don't have to weed through a lot of clutter... :/ Here's hoping you have many close matches in your near future! That is quite an amazing story! One question: why the focus on Y-DNA? Why not use autosomal instead or in addition? I've never gotten anywhere with either Y or mtDNA. The challenge with autosomal DNA is that its value falls off after about 5 or 6 generations. Meanwhile, Y-DNA (and mtDNA) are inherited largely unchanged for many generations. The paternal line DNA allows me to go back further in time while the autosomal DNA has mostly petered out at Thomas' generation. The likelihood that I'll pick up a paternal Kirk/Quirk ancestor still living in Ireland with autosomal DNA is unlikely - that's why I'm championing Y-DNA in this instance. Thank you for explaining. That makes a great deal of sense. I've just had no luck with Y DNA and marginal luck with autosomal. But obviously you know what you are doing! Good luck! Hello, I am of Kirk ancestry - traced to the 1700s in Pennsylvania, U.S.A. My brother is part of the Kirk surname project. My husband's grandmother said she had a distant ancestor named Quirk, so I'm interested from both sides to your Kirk ancestry. Are we in the same family group? We are Haplogroup 1 - IM253. Tested at 67 markers. That's curious... My Thomas Kirk may have been born in a part of Virginia during a time that the territory was disputed by Pennsylvania. My Kirk haplogroup is different, though. It's the ever-popular R-M269 umbrella haplogroup. I checked the Kirk surname group to be sure, but alas we're not grouped together. Thank you for checking, Susan. Excellent research and intriguing article. I am duly impressed with what you were able to deduce using Y-DNA. It's an example of what possibilities await those who apply themselves and combine research and science. Fascinating. It shows the value of DNA, but also the value of traditional paper research. Absolutely. In this case study, they work together in tandem. Although I suspect if I get back to Ireland I'll have to rely more heavily on DNA given the unfortunate records loss. Very interesting and informative. DNA is great but solid research is essential. Loved hearing about the surname evolution as well. Agreed. Traditional and genetic genealogy are mutually reinforcing and play a joint role in revealing the family history. Great case study! Especially impressed by your integration of DNA research as "tools in the kit" and not something used in isolation. I'm afraid lots of people just don't quite understand that DNA results (especially autosomal!) really don't accomplish much when unaccompanied by solid documentary work. I guess we have Ancestry's marketing blitz to thank for that! By the way, I live in Licking county, and most of my paternal lines settled here (eastern and northern parts of the county) between 1810 and 1840. I'm pretty strongly grounded in relevant sources and some of my graduate work dealt with migration into this area during the early 1800s. If I can help in any way or we can compare notes, I'd be happy to do it. Mark, I'm glad we've connected, and definitely would welcome the opportunity to compare notes (familysleuther@gmail.com). I've been meditating on next steps to try and learn more about Thomas' paternity/ancestral origins, but am unsure of other Licking County-based resources to search. Lately I've been exploring collateral lines - possible siblings to Thomas who also lived in Licking County (including in Monroe Township northeastern part of the county). Your research on early migration to the area sounds interesting. I'd love to learn more.